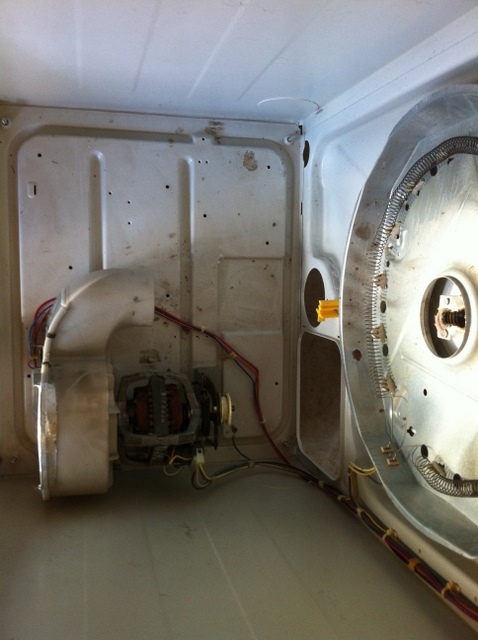 Dryer cleaning is a service many people are overlook when it comes down to essential maintenance in the home. Your clothes dryer is the second biggest energy consumer in your home after the air conditioner /central air heater. A buildup of lint in your dryer vent drastically reduces the performance and efficiency of your clothes dryer, resulting in larger utility bills and a potential fire risk. Why Clean Out Your Dryer Cabinet? 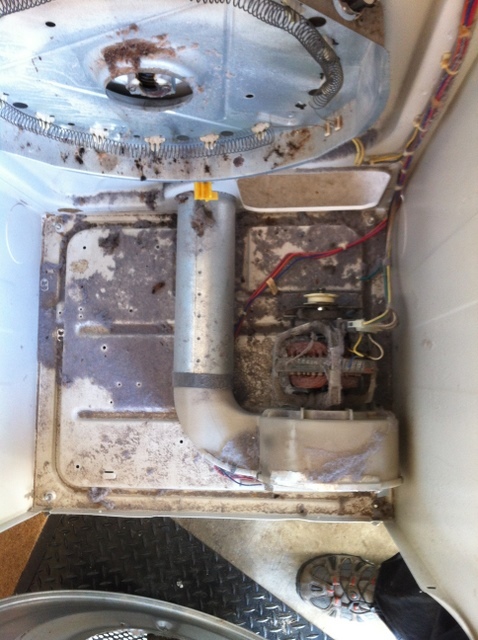 The reason is pretty simple really, lint should not be inside your dryer cabinet if your system is running properly. Hot air from your heater element passes through your clothes, through the lint trap, out through the dryers exhaust, through the transition hose, through the dryer vent to the termination point either on your outside wall or up on your roof. 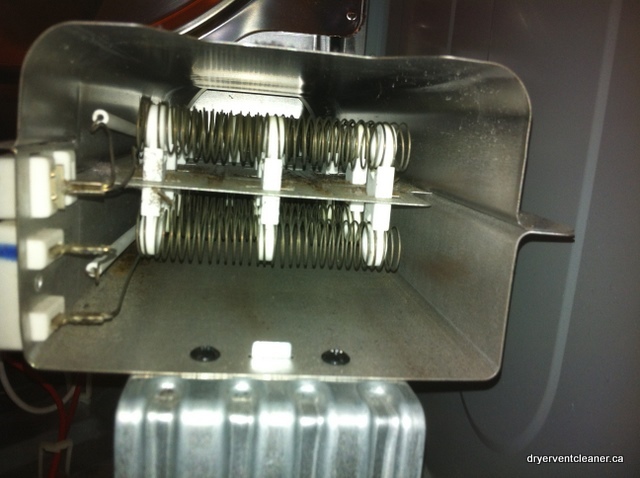 If you are cleaning your lint trap each time, and ensuring the exterior vent hood flaps are free from lint you should have very little lint inside your dryer, but it is still there! If you tend to forget from time to time about the lint trap and your outside vent tends to get clogged the the chances are you will have a lot of lint settled inside your dryer cabinet. Lint builds up in the cabinet and on and around the dryers heater element and this is a serious fire hazard. That’s right over 15,000 dryer fires each year, that could be avoided by correct maintenance. Dryer vent cleaning and dryer cleaning are the perfect solution to reduce the risk of a house fire, to save money on energy costs, increase the life of your dryer and prolong the life of your clothes. Here are a few photos to show just how lint accumulates in the dryer and dryer vents, you will also see photos where a dryer fire has started with lint that is burnt. 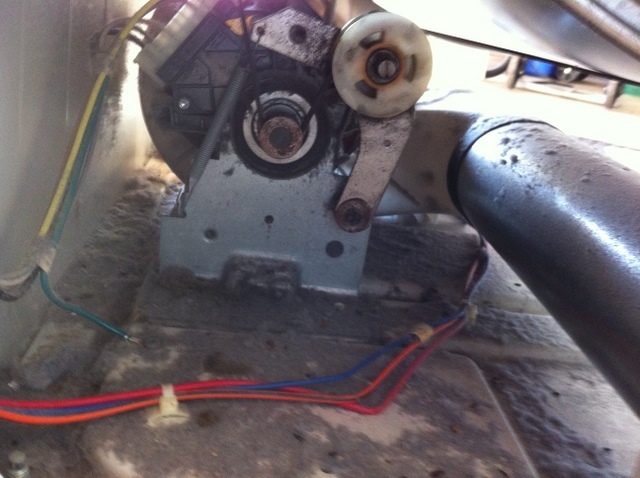 This first picture shows the lint all over the floor of the dryer cabinet, on top of the dryer motor and if you see the heater element (looks like a spring) those black marks are burnt lint. 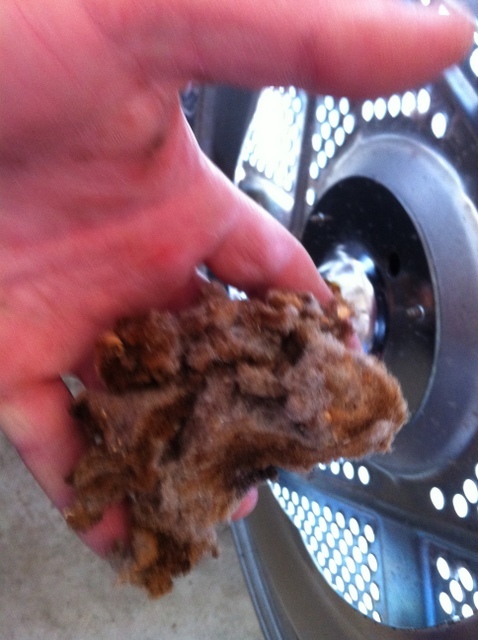 Here we have the same dryer that Dryer Vent Cleaner carried out the dryer cleaning on, all the lint was removed. The owner was horrified when she saw the burnt lint and has signed up for annual dryer vent and dryer cleaning. The owner of this dryer had only had the dryer for 4 years, but wanted us to clean out the dryer whilst we cleaned the dryer vents. Yet again there were signs of a dryer fire you will see that there is burnt dryer lint in the heater element you will see burnt lint. This is a worry for us as a dryer vent cleaning operation, yet trying to educate home owners seems at times to be a difficult task. We just hope that home owners realize that the fact their dryer is taking so long to dry their clothes, alerts them to call in an appliance technician before it is too late. Here is the heater element free from lint, we reduced the risk of a fire by cleaning the dryer and the whole dryer vent system. 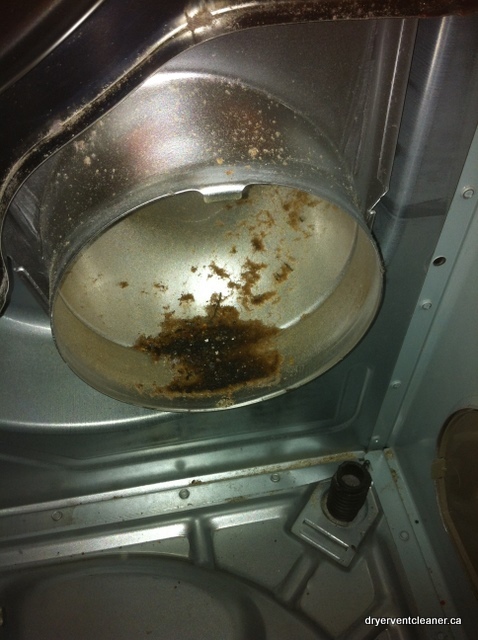 Here are signs of burnt lint inside the dryer cabinet. 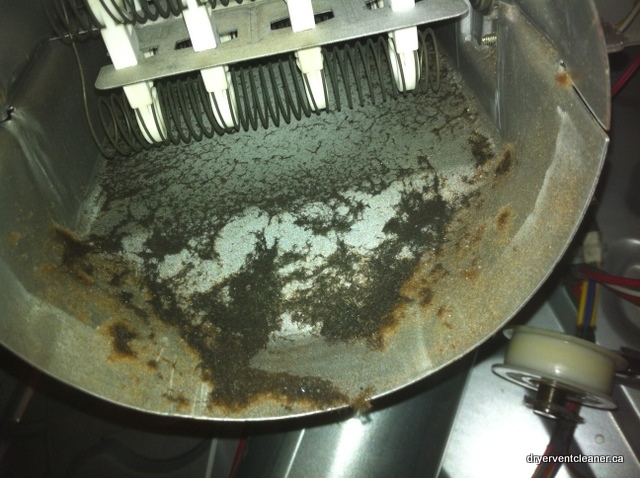 This if the dryer is maintained properly should not happen! Longer runs on your dryer vent can speed up the lint accumulation meaning you should have your dryer vent cleaned out more often. Everyone knows about changing their smoke alarm batteries when the clocks go back and forth, but what about your dryer vents! If your dryer is accumulating lint you could have a fire hazard sat right beside you and you know nothing about it. You have insurance but will it cover you for a dryer fire if you fail to meet the dryer manufacturers warnings – use only a metal transition hose (not thin foil or vinyl) and have your dryer cleaned out on a regular basis? Burnt Lint a True Fire Hazard! Many people ask what is lint? well for those not knowing what lint is here is a photo, only this is burnt lint that has been allowed to accumulate in the dryer for too long … Please if you do not know when your dryer was last cleaned, contact the Dryer Vent Cleaner so we can determine what state your dryer and dryer vent is in. We offer dryer vent cleaning and dryer cleaning, don’t wait until it is too late be sure to call us on 905 966 0838 to schedule an appointment.